Written in an easy-to-read, entertaining style, this resource provides K-12 teachers with concrete strategies, detailed sample lessons, and scenarios that illustrate what EDI techniques look like in inclusive and diverse classrooms. 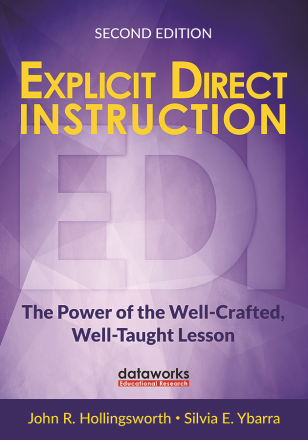 With chapters covering the individual components of EDI, such as checking for understanding and activating prior knowledge, this updated edition refines the methods so that they are even more effective and easier to implement. Take a sneak peek of the first chapter of our incredible book right here, right now! CHAPTERS 1 & 2 ARE ON US! We accept purchase orders, and can ship right away! "I flagged page after page. I had been a classroom teacher for ten years and was unaware of many of the EDI strategies." "Once teachers experienced EDI, they saw the value. Many teachers have told me they can’t remember how they taught before." "EDI makes students accountable. They see now that school is a place to work and learn and play, and they love it. Because even though it is hard, they are doing well." She served as a teacher, principal, and assistant superintendent at several schools before applying her knowledge of learning, language, and research to improve education in the classroom. With his varied background as a systems analyst, engineer, and musician, John has applied his analytical and presenting skills to the field of education, transforming lives with his insights into the teaching process.